Earlier this year the butcher bought me a nespresso machine for our 7th anniversary. I am absolutely in love with it and it has upped my level of “coffee snobbery” to an all new high, I won’t even look at a keurig, let alone drink from one! I prefer a rich strong cup of coffee or even better, espresso. So the watered down weak flavor of most keurig k-cups doesn’t suit me. But to each his own, it’s kind of like the difference between an iphone and an android, each user clearly thinks theirs is superior. Check out this interesting article for an eye opening comparison of the similarity between to the two coffee rivals to the apple vs Microsoft software war! 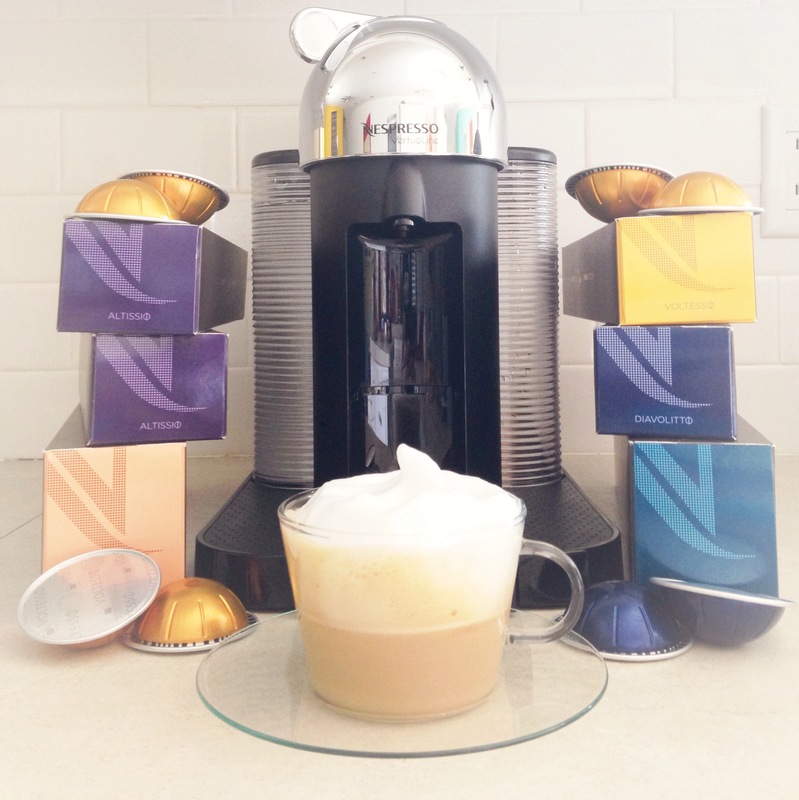 What is a nespresso you ask? First off, I recommend you go immediately to the nearest William Sonoma to sample it’s deliciousness. Built and designed by Swiss engineers, Nespresso coffee machines offer the best of two worlds: advanced innovation and extreme simplicity. Every detail has been carefully considered so you can enjoy the ultimate coffee experience. My machine, the Nespresso VertuoLine, is their newest model which makes an 8 oz cup of coffee as well as espresso in comparison to their former espresso only models. This machine offers a revolutionary, intelligent coffee extraction system that recognizes each capsule to deliver the best result for freshly brewed Coffee with crema (the rich hazelnut-colored foam which forms naturally when mixing air with liquid coffee. It helps liberate aromas from the cup just after extraction and then creates a lid over the coffee that keeps aromas in) as well as authentic Espresso. Only 1-2 % percent of all the coffee in the world is of the exceptional quality, taste and aroma standards required for Nespresso’s Grand Cru collection. Growing and preserving such high quality coffee is I’m sure challenging, but Nespresso believes that it is only by starting out with the best raw materials they can finish with a great cup of coffee. The coffee itself is fantastic and my favorite is the “Altissio”. It’s a full bodied creamy espresso made with Arabicas from Costa Rica and South America. The hint of Robusta contrasts with smooth cereal notes. The addition of milk complements its natural full body. Which is exactly how I like it, in a nice smooth latte form! Though all aromas are present in unroasted green coffee, they are only expressed fully once coffee is roasted. During tasting, light, floral and fruity notes are followed by heavier, roasted, woody or spicy notes and all of this truly stands out with Nespresso’s coffee. Now I know what you’re thinking…am I getting paid by nespresso to say all of this? No. But if anyone out there wants to, I’ll take it! I received some very happy mail today, my ipsy glam bag. 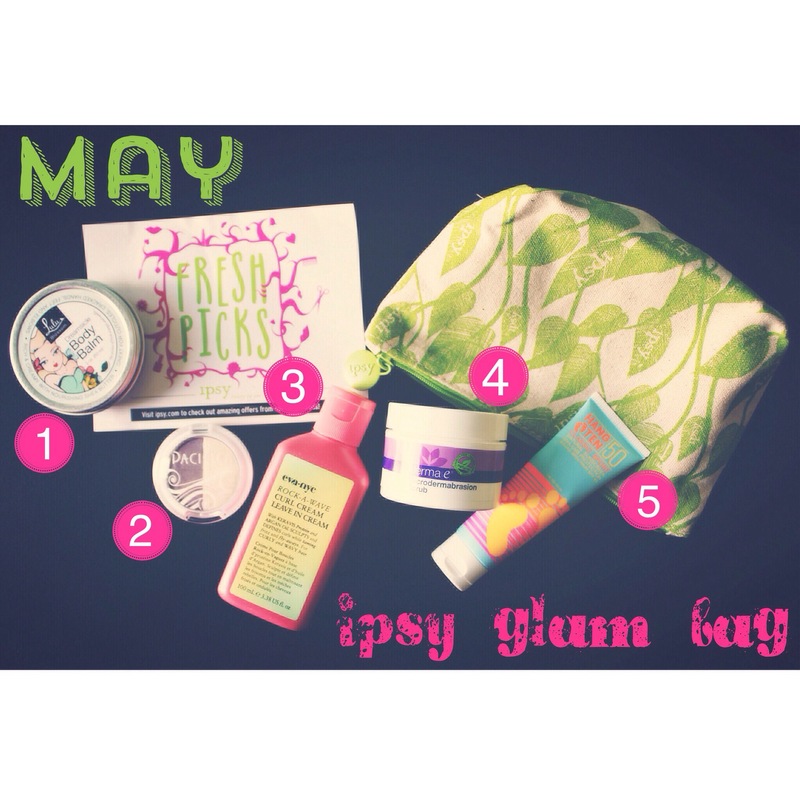 Ipsy is a beauty sampling service which, for only $10 a month, allows you to try a variety of different beauty products tailored to your likes (based on a detailed survey you take when you sign up with questions about hair & skin type, affinity for nail art, etc etc) Each bag is usually worth between $50-$100 and the sizes are very generous for the price. This is my third month using the service and so far I have been very pleased. I think we can all say we’ve spent $10 on ONE product only to get it home, hate it, and never use it again. So for me it’s totally worth it to try out several different products before committing to full size/price, have a great variety of options, and a cute bag to boot! There’s also a forum on their website where users give helpful reviews and even trade items since like I mentioned, due to each persons survey, products vary. I haven’t tried the trading thing yet, but maybe in the future. My products came in a lovely recycled fabric bag along with the message, “It’s a month of crisp air, vibrant flowers, and fresh Glam Bag products! Getting your beauty to bloom all month long will be as easy as lying in the warm grass and basking in the sunshine.” Here’s a list of my items as well as my initial review since I haven’t tried them all yet. This adorable 2 oz. tin is a great size for your purse or cosmetic bag and since a little goes a long way with this moisturizing product, it will last a long time. Simply made of Shea butter, wax, and grape seed oil, it’s creamy and nourishing without feeling greasy and has a light but pleasant tropical scent. I plan on keeping it in my nail kit to put on my cuticles and heels (which could use all the help they can get!) The label on the back also suggests using it as a pomade or quick fix for flyaways so that’s good to know too! I love Bare Minerals and MAC so I admit to being an eyeshadow snob but I don’t think it’s just me, I was not impressed with this. The label boasts a 100% vegan & cruelty free formula which is great and all but it also happens to be 100% BLA. There’s very little pigmentation and it barely shows up on the skin. Oh well, you win some you lose some. This one goes to the girl’s play makeup box! As any curly girl knows, we’re ALWAYS on the hunt for the perfect styling product. This one is full of Argan oil and Keravis Protein with a slight coconut scent so it should be good for my hair but the true test will be if it can tame my curls! I’ll keep you posted. Another 100% vegan & cruelty free product, I’m excited to use this scrub. Screaming bright citrus notes as soon as you open the lid it’s sure to wake up and brighten my skin with its gentle exfoliation. My skin is pretty good but I can always use a good exfoliator, especially on my nose which seems to be the most blackhead-prone area. Criticize me all you want but 50 is a little high on the sunscreen spectrum for my taste. I know I know, but I’m sorry, I like a little color! Numbers aside, this natural formula goes on very nicely with a thin non-gloopy texture. It has the classic sunscreen smell and upon smelling it I was instantly reminded of the way babies smell at the beach. You know what I’m talking about? Babies already smell heavenly but with the addition of sunscreen on their chubby little arms and legs and the salt air, there’s truly nothing better. This one is going right to my beach/pool bag it’s the perfect size for a last minute trip when I may forget the giant bottle. Well there you have it ladies and gentlemen (though I’m guessing more ladies…) I hope this review was helpful and I definitely recommend giving ipsy a try!